Luke Egan aka Filthy Luker is a mixed media artist from Bristol, best known for his unique urban installations such as a giant octopus and enormous googly eyes in trees. Filthy Luker works in a variety of mediums including paint, mouldable foams and latex, taxidermy and mutated objects. In 2004, Filthy Luker started making sculptural pieces mostly for installation in the urban landscape. 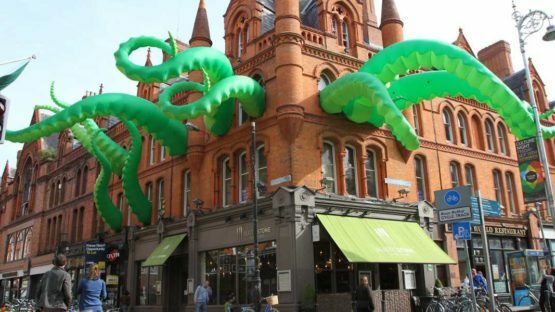 Using his wild imagination and sense of creativity, the artist’s oeuvre is comprised of a weird collection of urban interventions, including a tremendous green octopus creeps from the windows of a building, huge banana skin lounges in the middle of a road, gigantic pencils scribbling on walls, and real trees glare back at us with large inflatable eyes. Filthy Luker especially enjoys attacking places with octopus. 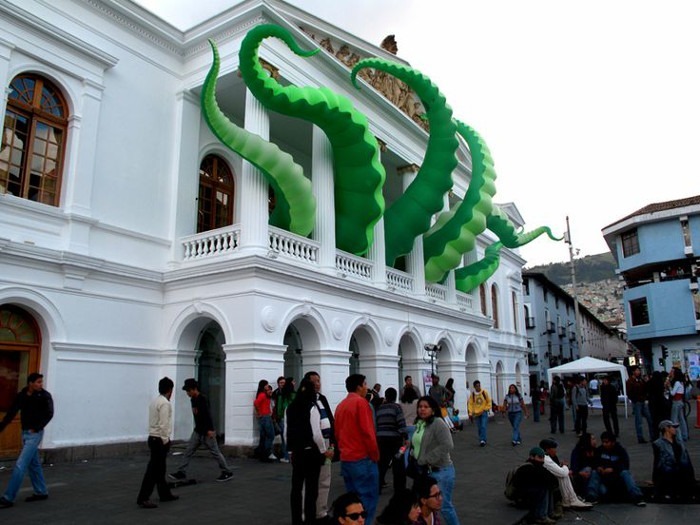 Once the artist has done with an installation, he calls these buildings and museums “octopied”. Commissioned pieces of octopus can be found in cities such as London, Geneva, Singapore, and Quito, Ecuador. In Filthy Luker’s urban intervention entitled Down the Plughole, the artist has been incorporating standard household objects into landscapes which became a bathtub. 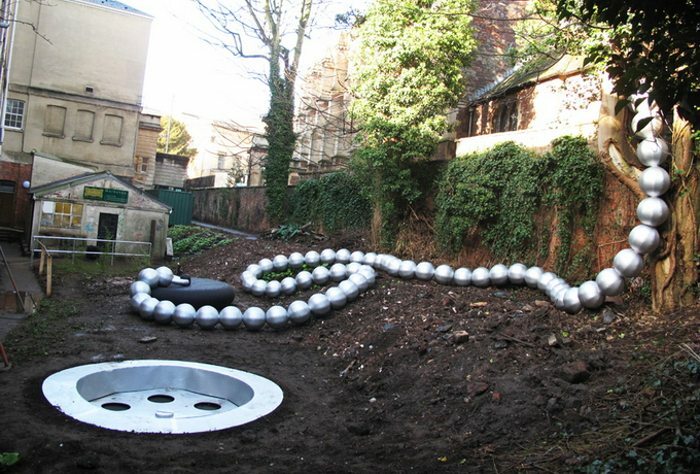 Set within the back garden of the Royal West of England Academy in Bristol, UK, the artist calls that piece a “passing comment on the education system”. In 1996, Filthy Luker began his artistic collaboration with a British artist Pete Hamilton aka Pedro Estrellas. Self-taught, driven by their love of playful public intervention and a great desire to create objects of large dimensions, the duo has worked on numerous projects, experimenting with shape, form and function. The artists have become widely renowned for their work under the name of their inflatable design company, Designs in Air. Using 3D design software and with a small team of specialists, Designs in Air has created plenty of bespoke commissions for all manner of projects around the world. 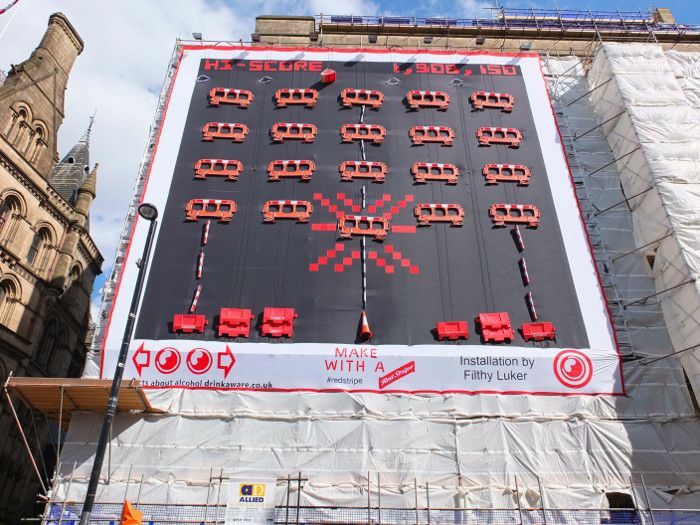 In March 2012, Filthy Luker created a 17m high Space Invaders Machine on Manchester’s Town Hall by using road barriers, traffic cones and other street furniture. The city’s largest ever interactive artwork which stayed in place for four weeks, was part of the Make with a Red Stripe, art project organized by beer brand Red Stripe. Actual software, written by Jnr Hacksaw, was fully interactive. The Space Invader game let passers-by to press a button set on a bollard and shoot invaders. Taking 70s’ arcade games to a new level, Filthy Luker’s piece actually relieved the monotony of the construction tarps, turning the old building wall into something fun and fresh. With electronic musician and hacker Jnr Hacksaw, Luke Egan and Pete Hamilton have released an innovative interactive music-making product called Musii – Multi Sensory Interactive Inflatable. 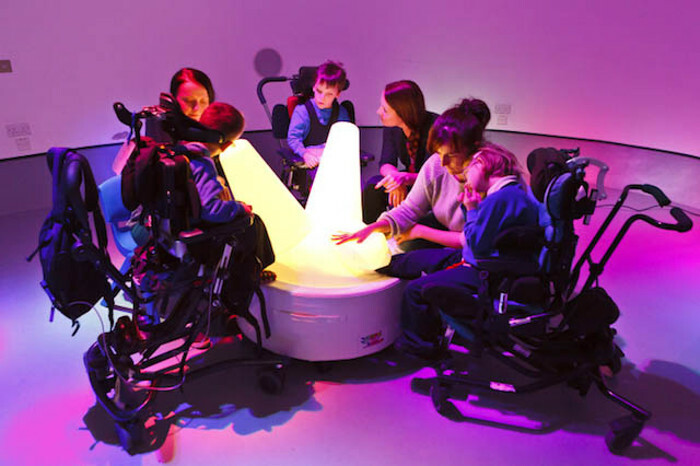 Although Musii was primarily developed for their own fun, it has been found to be a great therapeutic tool for people with Special Needs. Simple to use and needs no training or particular equipment to operate, Musii is an object that emits sound and is illuminated with colour when touched. It empowers any person to experience playing a musical instrument and it also offers stimulating visual and tactile sensation. Filthy Luker’s work is widely publicized online, has been featured in many magazines, a couple of books and been seen on television within special features and documentaries. Filthy Luker lives and works in Bristol, UK.